Sharon Wheatley here, reporting in from an unseasonably hot Weston, Vermont. I start rehearsals tomorrow morning, which means that I probably should be learning my lines and songs rather than writing a blogisode. Maybe I’ll hum while I write. Double duty. This blogisode is brought to you by The Vermont Country Store, where I am currently sitting. The view as I write today. The Vermont Country Store is a fantastic (yet weirdly expensive) potpourri of goods. It’s kind of like Meier, but full of goods from your childhood, like Gee Your Hair Smells Terrific and Marathon Bars. They also sell long johns and pine soap. And huge pickles. But the best part is the free samples of cheese and sausage and dip and fudge, which are all over the store, kind of like Costco. It’s like Meier and Costco housed in a series of log houses. But then again, nothing like that at all. Come visit! This blogisode might also be brought to you by the ads that have suddenly appeared on this blog—let me know if you see them and if they bug you. Apparently once you have a certain amount of traffic on your blog, advertisers buy in. The good news is that I now have a lot of traffic (thank you). The bad news is the ads—although the one I saw yesterday was funny—it was “Check the pancreatic enzymes in you pet!” which might be a combination of me talking about my love of dogs and Rob’s pancreas, which proves Big Brother is reading and placing ads. 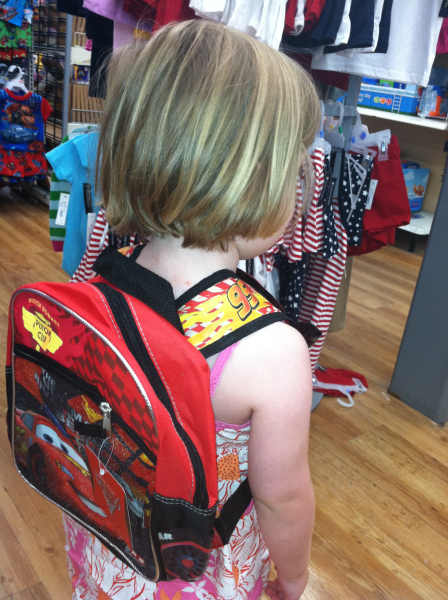 Beatrix sporting the "red pack-pack" she insisted she needed for her first day of "school" (day camp). Back to our story! I have to write super fast today because I have to get the kids from camp in one hour and twenty minutes and this is my window for Internet. Here we go. We left off at about 9pm on Sunday night, with Rob just getting the news that his enzyme levels were crazy high, he was in the hospital for a long time (until the levels dropped), the kids at home with Hannah, Rob still stretched out on a gurney in the ER, and me worried and humiliated that I confused the pancreas and the prostate. Hey—listen—I hated science—but I sing well! I decide to call Double Dr. Andy Nowalk who has given me a crash course in various aliments in the past. I try to avoid cashing in these chips very often, but this seemed like an emergency, and to add validity to the call, I stood under the awning of the Lenox Hill Emergency Room to make the call. Andy has an amazing bedside manner, especially over the phone to the idiot wife of the patient. I did my best to repeat what I had heard and he efficiently asked questions and explained what was going on. Basically, what Charlotte has said was right. 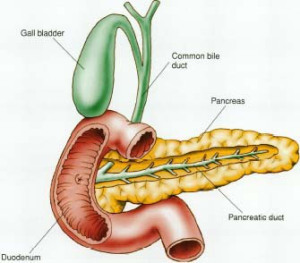 A pesky little stone had escaped from the gallbladder and was clogging up a duct that led to the pancreas. What that did was cause the pancreas to back up and also impacted the liver. Andy went on to explain that Rob’s enzyme levels were dangerously high and that while he was a healthy guy and ultimately fine, I should not be surprised if any of his other systems started to shut down. He said he could be placed on a ventilator—not to let that scare me—it was just a way of them giving his body support while his pancreas healed. He also said that this was all good news because it wasn’t pancreatic cancer, which he thought I had probably been scared about. He thought I was probably relieved. I didn’t mention that not only had I not thought about pancreatic cancer, but for most of the conversation with the doctor I’d though he was talking about the prostate--proving sometimes being stupid about medicine is a blessing. Rob downloaded this "cheesy diagram" as he called it because he thought you might all like to see what Dr. Andy was talking about. It is not the prostate (that is what I can tell you). To start at the beginning of this story, go here. We hung up with Andy suggesting that I get some help for the kids so I could stay with Rob as much as possible--explaining that it is always good to have an advocate in the hospital, and that he would more than likely be getting that gallbladder out after his pancreas healed. Which could be well over a week. I was (and am) so grateful to Double Dr. Andy, and I told him (as I always do) that if he ever had a musical theater emergency, I was the one to call, day or night. You know, like if he needs house seats to a performance at Pittsburgh Civil Light Opera. Or needs an uptempo for a baritone. Or wants to learn a time step. That kind of thing. Musical Theater Emergencies.. I hung up with Andy and immediately started making phone calls. As I figured it, I had three agendas to deal with. 1) Be Rob’s (better informed) advocate in the hospital as much as possible, but also have an understudy to fill in for me when I can’t be there. In dealing with the kids, I knew I had several options for the short term. Hannah had offered to stay overnight, my friend Jacob was great with my kids and available to do things like take them to the playground and out for pizza, and my friend Brynn called and made an offer I couldn’t refuse. This is basically the perfect voice mail I got from her. Brynn and Beatrix have a stare down with a pumpkin. Let me tell you all the things about this voice mail that are perfect, because I think it is important to break it down. Those of you who have been in a position like the one I was in—a very ill husband with two kids at home and no family nearby-- can read along and nod in agreement. 1) This was her idea and she didn’t ask, she just said she was doing it. That takes all pressure off of me to have to ask or feel guilty. She was just planning to go and simply needed to be buzzed in. Perfect. 2) Brynn O'Malley saying she "cleared her schedule for 48 hours" is astounding in and of itself. She is quite fancy and has auditions for every important play, musical and TV show on a daily basis, so how she cleared things I'll never understand--but will always be grateful. Perfect. 3) Brynn can be super fancy and beautiful, but is also the person who shows up with pajamas, a bag full of vegan food divided up in little plastic bags from Whole Foods, and her own tea bags. She is like a hiker, she packs in and packs out, needing nothing, and is willing to sleep on an air mattress. Perfect. 4) Brynn is astonishingly entertained by my children--possibly surpassing even me in finding them hilarious. She is happy to sit on the floor, munch on nuts and watch them do excerpts from The Sound Of Music over and over again. Perfect. Hannah, Brynn and my dear friend Jacob Brent worked out a schedule to cover the kids, and I was able to focus on Rob and finding a longer-term child care solution. Our lovely friend Amy Rogers (she's the head of Pace University Musical Theater with Rob), who we call our Sister Wife, agreed to sit with Rob in the hospital so I could get some sleep and take Charlotte to school. I started making tough phone calls to family members to see if anyone could drop everything in their life and come to New York. While I waited to see if anyone could do it, I went back in the ER to check on Rob, only to discover that there was no bed available in the ICU--he was going to be spending his first night in the Emergency Room itself. Or as we like to call it, Crazy Town.